Obverse description: Crowned bust facing with pellets to side of curls and elongated neck. Reverse description: Voided long cross with quatrefoil in each quadrant. Discovery circumstances: Date listed is date submitted for recording. 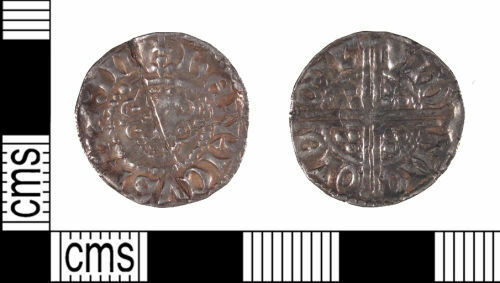 A silver penny of Henry III, voided long cross reverse, Class 3c, minted in London by Nicole, 1248-1250. North, Vol I, p.226, no.988. A silver penny of Henry III, voided long cross reverse, London mint, moneyer Henri, Class 3c, circa 1248 - 1250. North Vol 1, p.226, no.988.